Unfriending people on Facebook, moving to Canada, or changing a long-term portfolio because of an election are all awful ideas. We are in the midst of our tenth consecutive “most important election in our lifetime!” This nonsense is really starting to get old. We need to take a fresh approach. Hopefully this will dispel two very disconcerting 2016 election theories. The first being this is a “Flight 93” election; meaning we need Donald Trump to crash the cockpit to prevent our country from being hijacked by traitors. Second, Hilary Clinton is the only thing that stands between us and a Trump-led military dictatorship that would be the envy of Benito Mussolini. Let’s take a journey back in time to put this hyperbole into its in proper historical perspective. In 1824, the presidential election WAS stolen from Andrew Jackson. Neither candidate had an electoral college majority so the decision was thrown to the House of Representatives. This culminated in a shady deal between Henry Clay and John Quincy Adams, which gave Adams the presidency, though Jackson was clearly the choice of the people. Talk about a rigged election. Jackson spent the next four years destroying the credibility of Adams. This led to Jackson’s election in 1828. Despite what Donald Trump says about contesting the election if he loses, Andrew Jackson did this 188 years earlier, and the nation survived. Abraham Lincoln’s election in 1860 led to the South’s secession from the Union and ultimately resulted in the Civil War, in which 500,000 Americans died. One could say a few punches thrown at a Trump rally do not a civil war make. In 1864, Lincoln defeated his opponent, General George McClellan. If Lincoln did not emerge victorious, McClellan would have allowed the South back into the Union with slavery intact. People will talk about the 2016 populist uprising led by Bernie Sanders. 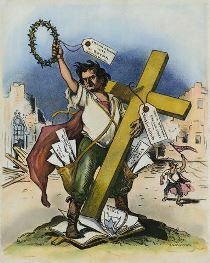 In reality, Sanders was quite tame compared with the rhetoric of democratic candidate, William Jennings Bryan in 1896. “You shall not press down upon the brow of labor this crown of thorns. You shall not crucify mankind upon a cross of gold!” bellowed Jennings. Now that was a speech to start a rebellion! Shortly after the 1900 election, President William McKinley was assassinated by an anarchist. This led to Vice President and Rough Rider, Teddy Roosevelt assuming the presidency. Roosevelt had been hand selected for the role of vice president as a way of keeping him irrelevant; during this period, this job could be equated to being placed in a Witness Protection program. After a long search in the Adirondack Mountains to actually find him, Roosevelt was sworn in. The nation could not believe someone as unfit and emotionally unbalanced could be in charge. Most would agree he worked out just fine. We have also been told that this election will result in the dissolution of one, if not both, major political parties. The last time this happened was in the 1850s! This occurred when the Whigs refused to accept a stronger anti-slavery stance and the Republican Party grew to the power it is today. It has been said that Donald Trump has done so much damage to the Republican Party, that they may never win another presidential election for the foreseeable future. Both parties have returned to the presidency after much worse calamities. Grover Cleveland was elected in 1888, even though his Democratic Party had been blamed for the Civil War of 1861-1865. Dwight D. Eisenhower returned the Republicans to the White House in 1952, not too long after the Republican-blamed Great Depression of 1929-1939. While there has certainly been much turmoil in the current election cycle, how could anyone compare this to 1968? The Democrats’ leading candidate was assassinated and their nominating convention in Chicago turned into a virtual war zone on live television. While many people distrust Hilary Clinton for her questionable behaviors, does this really compare to the Watergate scandal that occurred during the 1972 Nixon/McGovern election? The paranoia and secrecy of the Nixon administration almost makes Hilary Clinton look transparent in comparison. For the moment, members of the opposition are not killing each other in duels. The same cannot be said for Vice President, Aaron Burr, who murdered his rival, Alexander Hamilton, in a duel in 1804. In the end things will work out despite what the hyper-partisans are saying about the 2016 election. Something tells me this streak will not be broken no matter who wins “the most important election of our lifetime” on Tuesday.